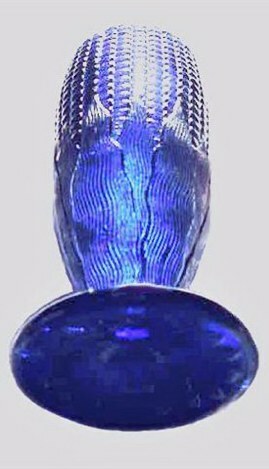 This Ice Blue CORN VASE with Stalk Base has little iridescence but is quite rare. 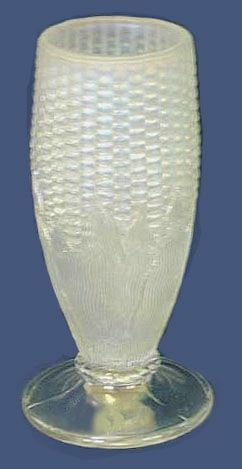 This White CORN VASE has a very frosty appearance. 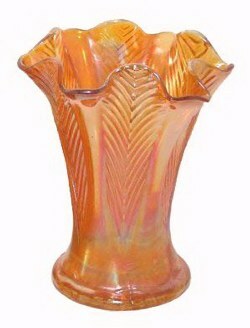 CORN VASE: These very popular vases debuted during the 1911-1912 timeframe. If you like looking at quite a few examples in one pattern, then this is certainly one to go for! The vases having a plain base are found in marigold, amethyst, white, green, ice green, lime green, aqua, Coke bottle green, black amethyst and blue!---as of late-Oct.2008. Seems that a blue Corn Vase was “found” at a local auction about 20 years ago and known to have matriculated to a prominent Texas collection where it was described as a “one-of-a-kind”! Question is: Has Steve found #2, or could this possibly be that first “find”, reportedly having a slight nick along the upper edge? in Green - 12 in. tall. 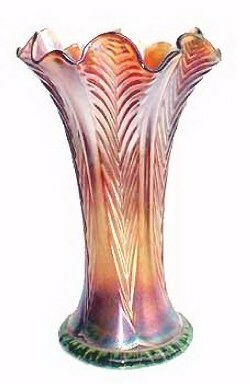 FLUTE: Marigold, amethyst and green are the colors for this vase, although amethyst examples are the most difficult to find. It has a round marie, eight panels and the height ranges from 8” to 14”, usually. 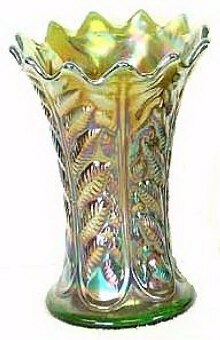 Green vases will often have the Alaskan iridescent finish. Ice Blue GRACEFUL Vase - 5.5 in. tall. Underlined N-no circle. GRACEFUL: Circa 1908-1910, Graceful was one of the early carnival efforts. 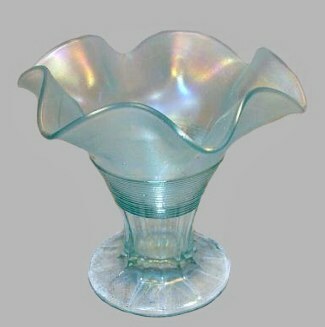 Previously a part of an earlier Northwood line called Spool, (made in mosaic (slag) and non-iridized opalescent colors from 1903-1906. Marigold, amethyst, and green are the usual colors. Amethyst vases are somewhat difficult to find. For the most part, this is an overlooked pattern. 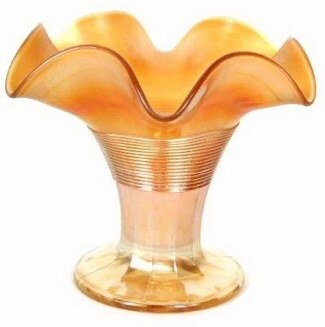 The shape is always as you see here, with some collectors placing it in the compote category. Some have an impressed star on the underside of the base, while others are plain. In production at least through 1912 and the introduction of pastels. Extremely rare examples of ice blue and white exist. the base of stem-as Fenton versions possess. JESTER CAP: 5 ½”-7 ½” tall, depending upon the shape. Four different shapes and an equal number of colors are to be found. Some are trademarked, others are not. This particular shape is more often found in marigold than amethyst, green or cobalt blue. A cone shape is known in marigold. The four-ruffled shape is found in marigold, amethyst and cobalt. 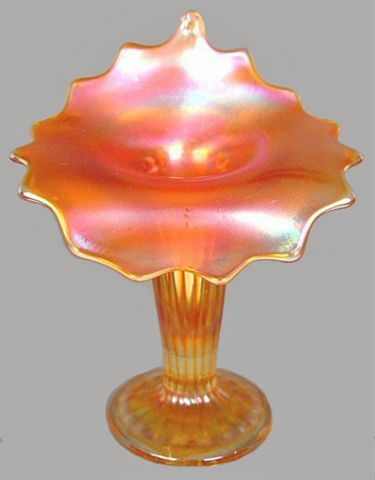 The six-ruffled shape is found in all four colors mentioned. 10 in. LEAF COLUMNS Vase in IB. 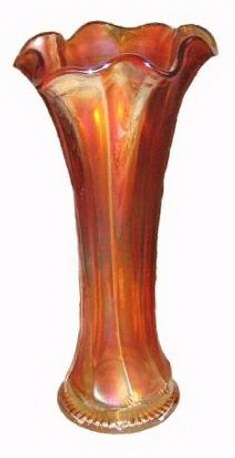 LEAF COLUMNS Squatty Vase-6.5 in. tall in Green.